This PetroKnowledge training course on Effective Government Relations for the Oil & Gas Sector will provide participants with a thorough understanding of the government relations function within the oil and gas sector. Participants will gain an understanding of the business value that a strategic approach to government relations can deliver at all stages of the oil and gas investment cycle: exploration and production, transportation, trading, processing and distribution. The training course will provide insight into the role government relations plays in winning new business, building and reinforcing a strong reputation, supporting operations, managing change and resolving disputes. 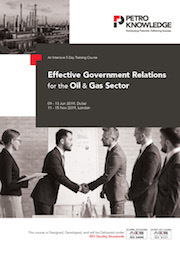 This PetroKnowledge training course on Effective Government Relations for the Oil & Gas Sector will utilize a variety of proven adult learning techniques to ensure maximum understanding, comprehension and retention of the information presented. The daily workshops will be highly interactive and participative. The training course will be based on interactive exercises and case studies drawn from a wide range of countries and situations. One day of the course will be dedicated to a practical business game based on a realistic scenario.